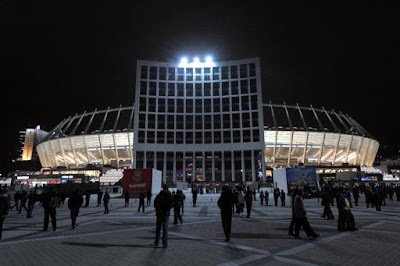 KIEV, Ukraine -- Ukraine has finally opened all the stadiums that will host Euro 2012 matches but there remain fears that the biggest event the country has hosted since independence will be mired in organisational problems. A view of Olympic Stadium in Kiev. After repeated delays Ukraine in the last weeks opened a reconstructed stadium in the capital Kiev for the football extravaganza and a completely new venue in Lviv to go with already ready facilities in Kharkiv and Donetsk. But hotel rooms will be insufficient in one city, transport issues yet to be resolved and Kiev hoteliers are planning a massive price hike during the championships which Ukraine is co-hosting with Poland. On top of the housing and transportation problems, the first events at the stadiums in Kiev, which will host the final on July 1, and Lviv were mired in organisational glitches. After three years of reconstruction, the first game at the 70,000 seat Kiev Olympic Stadium on November 11 was marred by incidents due to malfunctioning infrastructure. Thousands of fans forced their way into the stadium as several turnstiles in the entrance were closed for an unknown reason. Some climbed the two-metre-high fence, others broke metal doors to enter, witnesses said. "Thank God, there were no casualties," Olexiy Mochanov, a TV presenter, said on his blog blaming the authorities' "idiocy" and poor organisation. "I will never go to this stadium again." In Lviv, fans were forced to walk three kilometres (miles) from the nearest bus station to get into the 33,000 seat arena built in the city's outskirts. "The organisation of the first matches was carefully analysed. All issues will be resolved as quickly as possible," the head of the UEFA-funded local organising committee, Markian Lubkivski, told a press conference. The stadium in Kharkiv has been operational since 2009, as has the ultra-modern venue in Donetsk which has benefited from the support of the local tycoon and Shakhter Donetsk owner Rinat Akhmetov. But Donetsk even lacks hotel rooms to accommodate UEFA's own official delegations -- there were only 2,700 available in October while UEFA demanded 5,500. "In all likelihood, there will be a need to organise charter flights from Kiev and Dnepropetrovsk for those who wish to attend matches in Donetsk," Lubkivski said. The room situation for fans there remains unclear. The three other host cities are better set to receive tourists during the tournament on June 8 -- July 1, but prices may shock visitors as rates for hotel rooms and apartments for rent are expected to double or even triple. Prompting booking rates to soar, the supply was very limited in November. Prices ranged from $133 for a bed in a hostel dormitory and $797 for a room in a four-star hotel in Kiev. "We asked the hotel owners to set reasonable prices, but we have no means of influence," Lubkivski said. Prominent TV football commentator Olexandr Glyvynsky -- who also acts as spokesman for the national football team -- said he is particularly concerned by bad roads. "My biggest worry is about fans coming by car. We have terribly few road signs, even fewer in Latin letters, no light and the roads are often covered with potholes. Europeans risk having a culture shock here." But he added that while there were still organisational troubles "it's nothing comparing to those we used to have" before the stadiums were opened and there was still time to fix the remaining issues. In Kiev, where a new airport terminal is to be inaugurated in June 2012, the authorities promised to intervene with the taxi companies whose drivers tend to exploit tourists. Ukraine also came under criticism by international animal advocacy groups for the cruel extermination of stray dogs when reports in media said animals were in some cases burned alive or poisoned as Euro 2012 approached. Meanwhile the build-up to the championships has also coincided with an international uproar over the imprisonment of the former prime minister Yulia Tymoshenko, which Poland and the EU say is politically motivated.